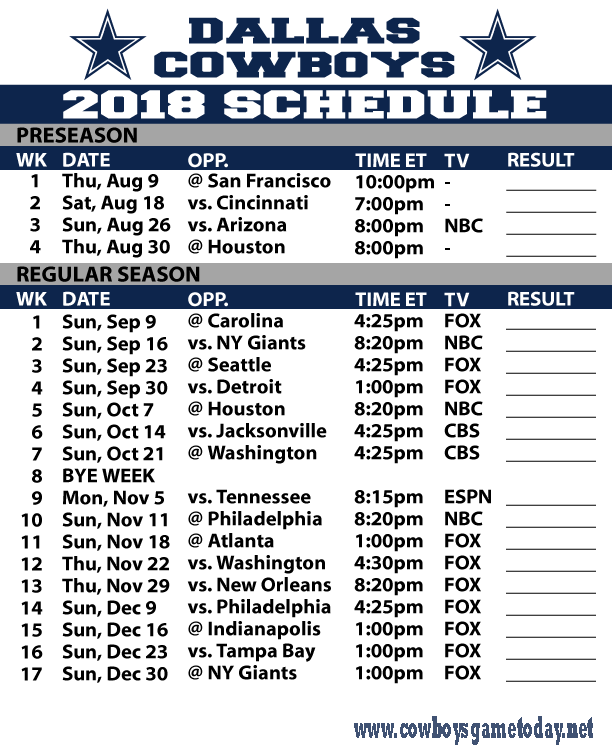 Week 1 (Sept. 9) vs Carolina Panthers (3:30 p.m. FOX): The Cowboys will take the field for the first time without Dez Bryant. At least the Panthers had a middle-of-the-road secondary unit last season, but Cam Newton will give the Cowboys’ defense fits. Week 2 (Sept. 16) vs New York Giants (7:20 p.m. NBC): The Giants have the No. 2 overall pick and could use it on the top running back prospect, Penn State’s Saquon Barkley, who could revive a stagnate offense. So could former Cowboys receiver Dez Bryant. But the Cowboys win their home opener. Week 3 (Sept. 23) vs Seattle Seahawks (3:25 p.m. FOX): The Seahawks are in a remodeling mode, at least defensively, but still have the hard-to-contain Russell Wilson at quarterback. The Seahawks got the best of the Cowboys last season, and that continues into 2018. Week 4 (Sept. 30) vs Detroit Lions (noon FOX): Will new coach Matt Patricia have the Lions defense playing at a higher level? You can already pencil Matt Stafford in for another 4,000-yard season, but give the Cowboys the edge here. Week 5 (Oct. 7) vs Houston Texans (7:20 p.m. NBC): Deshaun Watson looked like the real deal last season before an ACL injury. Oh, and the Texans still have a guy named J.J. Watt, who has endured two consecutive injury-plagued seasons. This has the makings of a loss. Week 6 (Oct. 14) vs Jacksonville Jaguars (3:25 p.m. CBS): The Jaguars have suddenly become Super Bowl contenders with a top-notch defense, but Blake Bortles remains a mystery. Still, that defense is hard to ignore. Week 7 (Oct. 21) vs Washington Redskins (3:25 p.m. CBS): The Cowboys get their first look at the Redskins with quarterback Alex Smith, who is dismissively called a “game manager.” That bodes well for the Cowboys to get back on track in the nation’s capital. Week 9 (Nov. 5 Monday Night Football) vs Tennessee Titans (7:15 p.m. ESPN): Mike Vrabel inherited a playoff team from last season, but quarterback Marcus Mariota is coming off a season in which he had more interceptions than touchdowns. The Cowboys get to the .500 mark at the halfway point. Week 10 (Nov. 11) vs Philadelphia Eagles (7:20 p.m. NBC): The defending Super Bowl champs will be eager to show off their rings to the Cowboys on this night. This won’t be a memorable night for the Cowboys. Week 11 (Nov. 18) vs Atlanta Falcons (noon FOX): Fortunately for the Cowboys, Adrian Clayborn is headed to the Patriots and won’t be able to torment Chaz Green again. But the Falcons still have a guy named Matt Ryan. Week 12 (Nov. 22) vs Washington Redskins (3:30 p.m. FOX): A Thanksgiving Day match-up against a division rival is always entertaining. The Cowboys won this game two years ago, 31-26, and need to win again to keep their playoff hopes alive. Week 13 (Nov. 29) vs New Orleans Saints (7:20 p.m. FOX/ NFL Network): Drew Brees is 5-3 in his career against the Cowboys, but lost the last time he visited AT&T Stadium (Sept. 28, 2014). He’ll find himself on the losing end again against a desperate Cowboys squad. Week 14 (Dec. 9) vs Philadelphia Eagles (3:25 p.m. FOX): It seems like the Eagles and Cowboys always play a thriller in Texas and this time should be no different. But the Eagles prevail and sweep the Cowboys for the first time since 2011. Week 15 (Dec. 16) vs Indianapolis Colts (noon FOX): This game won’t be on the level of Super Bowl V, but the Cowboys should have a good understanding of what new Colts defensive coordinator Matt Eberflus (the Cowboys’ linebackers coach from 2011-17) is trying to do. Week 16 (Dec. 23) vs Tampa Bay (noon FOX): What’s a nice early Christmas gift? Facing a team like the Bucs, who ranked last in total defense in 2017. Week 17 (Dec. 30) vs New York Giants (noon FOX): The Cowboys had a successful trip last December to MetLife Stadium, rolling to a 30-10 victory. This December they hope it clinches a playoff berth.